Baby Bradley is a sweet little baby boy. He is asleep, shhhh. Stretched out he is approx. 1.5" long. He wears a sweet little white diaper shirt trimmed with purple bunka and a purple rayon diaper trimmed with white bunka. He also has a tiny light purple bib on that says'baby'. He will come with his tiny porcelain bottle. His hair is hand applied in thin layers and is a light brown. He is gently poseable at the shoulders, hips, and head. Jocelyn is a sweet little baby girl. Stretched out she is approx. 1.5" long. She wears a white long gown trimmed with beautiful light orange hand crochet lace. Her tiny toes are showing as she has kicked her gown up on her right side. She wears a lovely light orange bonnet trimmed with tiny flowers at the ties over her brown curly hair. 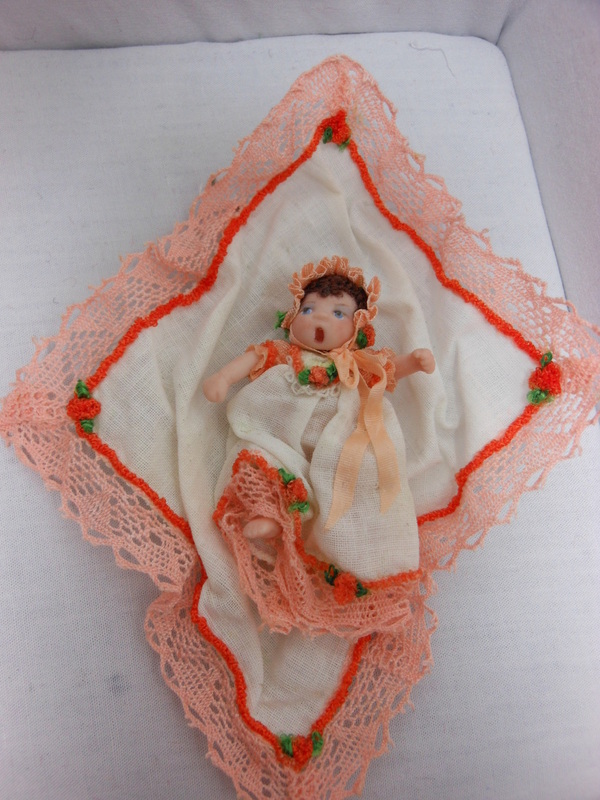 She will come with her white blanket trimmed with more of the light orange lace, orange bunka, and tiny flowers. She is gently poseable at the shoulders and head. Jocelyn's gown and blanket were made from an antique handkerchief. Baby Emma is cast in Mulatto slip. She wears a gown made of light green linen trimmed with hand tatted lace. She was dressed from an antique handkerchief. 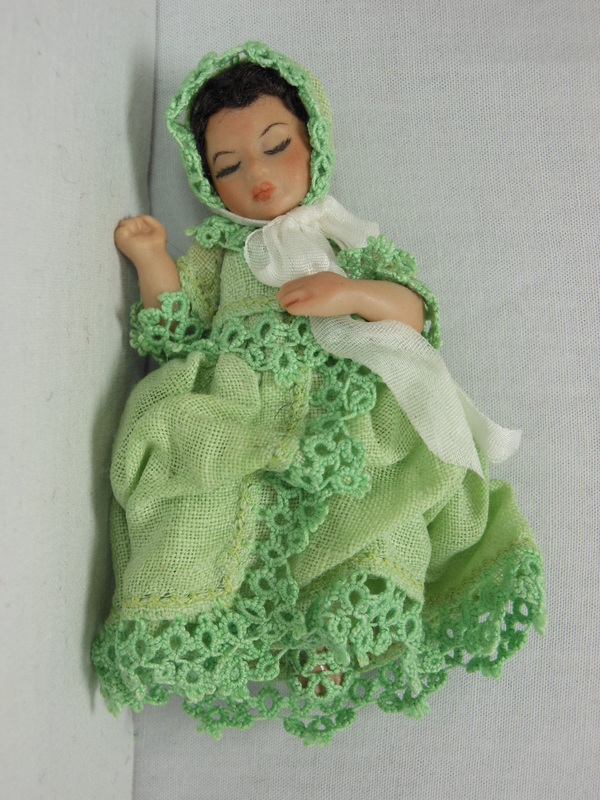 She wears a bonnet, slip, and slippers on her sweet little feet made from the same hankie. Her bonnet is tied by a large white silk ribbon. Her hair is a dark brown color and very curly. She is 3" long. Robin is a sweet little blonde haired child in a seated position. She is wearing light pink top and pants trimmed with dark pink bunka and white roses. She has on a cap to match her outfit. On her dainty little feet she wears pink silk slippers with leather soles. Robin is gently poseable at her shoulders and hips. Gina is a sweet little toddler. She wears her little white cotton diaper and a white and pink lace top and cap. She has on white and pink tiny booties on her tiny feet. Her hair is blonde and has tiny curls in it. Gina is gently pose-able at her shoulders and hips. She can be posed laying down or sitting as you wish. She is full porcelain. 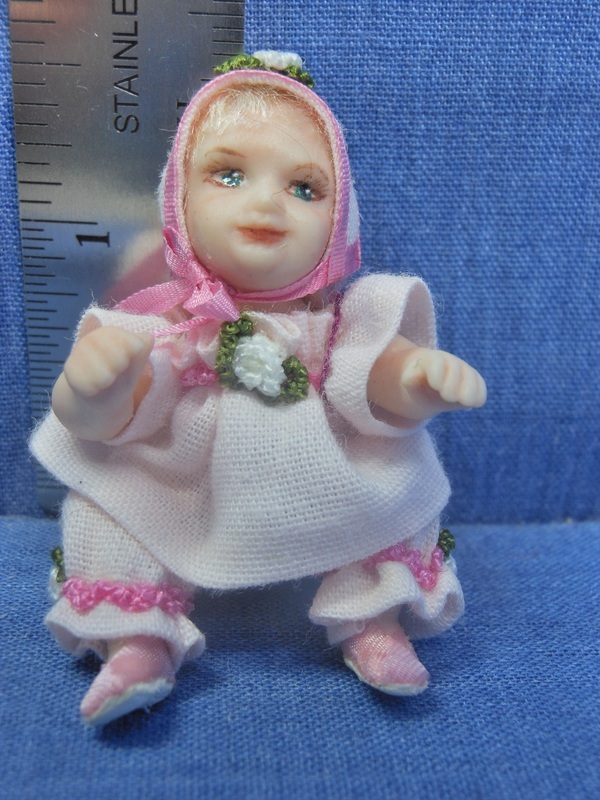 Sydney is a sweet little full porcelain dollhouse doll that is 1/12th scale. She measures around 2" tall when lying down. 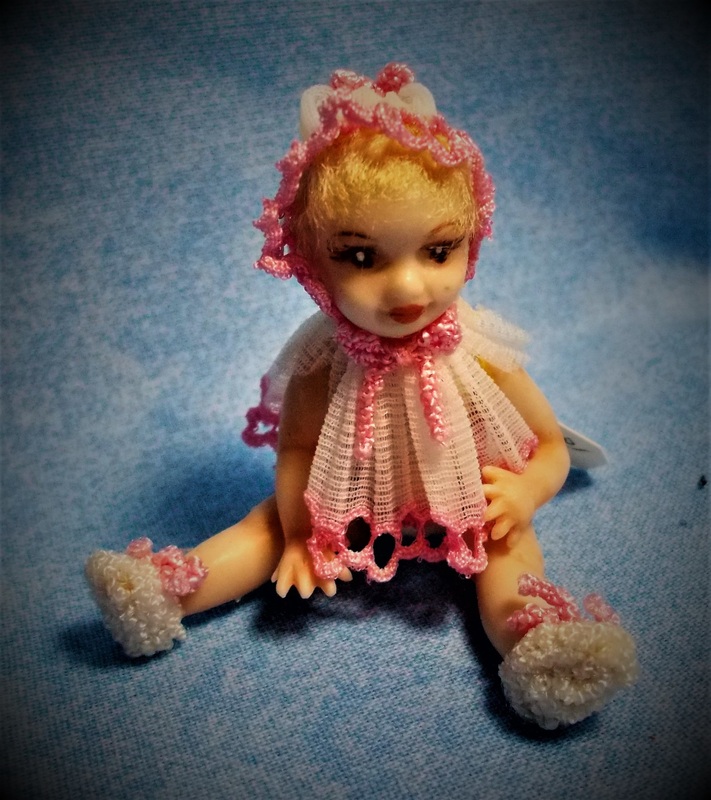 She is wearing her tiny white rayon diaper and her had knitted light purple sweater and cap set trimmed with darker purple bunka and a tiny white silk bow under her chin. She is gently posable at her neck, shoulders, and hips. Sydney has light brown hair and green eyes. She is cooing as she stretches her darling little body after her long nap. Sydney also comes with her hand crochet light purple blanket that measures approximately 3" X 3". Kassi is a cute little toddler dressed in a bathing suit. It is purple rayon and trimmed in yellow bunka with a bear motif in front. She is in a seated position. If she were able to stand, she would be aprox. 2.5" tall. She has light brown short curly hair. She is gently poseable at the shoulders and hips. She can be posed to crawl. Adelyn is an adorable 1/12th scale dollhouse doll. She is full porcelain and gently poseable at her shoulders and hips. She is wearing her tiny white diaper set and white rayon booties trimmed with yellow bunka and tiny light green buttons. She also has on her light green hand knitted sweater and cap trimmed with yellow bunka and a white silk ribbon bow under her chin. Her hair is red and curly. She is just under 2 1/2" tall when lying down. 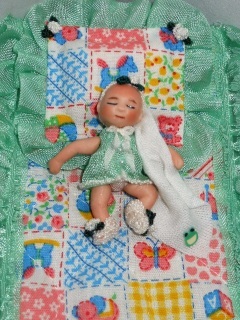 She can sit or lay on her little green hand crocheted blanket that measures around 3" X 3". Emily is a sweet little 1/12 scale dollhouse baby. She is approximately 2" stretched out. She wears a cute little green diaper shirt and her white diaper made of rayon trimmed in bunka and a white silk ribbon bow. Emily is gently poseable at her neck, shoulders and hips. Her tiny white shoes are made of bunka and trimmed with a tiny white rose just as her little bald head has a white bunka headband with another matching tiny white rose. She holds her special 'blankie' in her left arm. Emily is asleep on her crib blanket and pillow trimmed with luscious green rayon ruffles and tiny white roses at the corners. 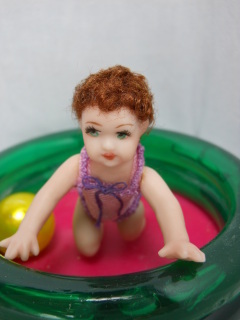 Judith is a cute little toddler dressed in a bathing suit. It is pink rayon and trimmed in purple bunka with a bow in front. She is in a seated position. If she were able to stand, she would be aprox. 2.5" tall. She has light brown short curly hair. She is gently poseable at the shoulders and hips. She can be posed to crawl. Adam is a cute little toddler. 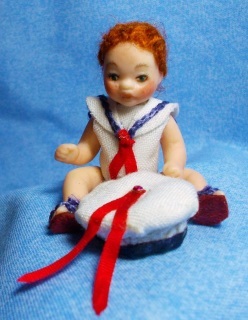 He wears his little sailor suit onesie, and comes with his little sailor's cap. He has blue sandals with leather soles on his tiny feet. His hair is red and has tiny curls in it. Adam is gently pose-able at his shoulders and hips. He can be posed laying down or sitting as you wish. He is full porcelain. Daniel is a cute little boy who is full porcelain and approximately 2 " tall. He is a 1/12th scale dollhouse doll. 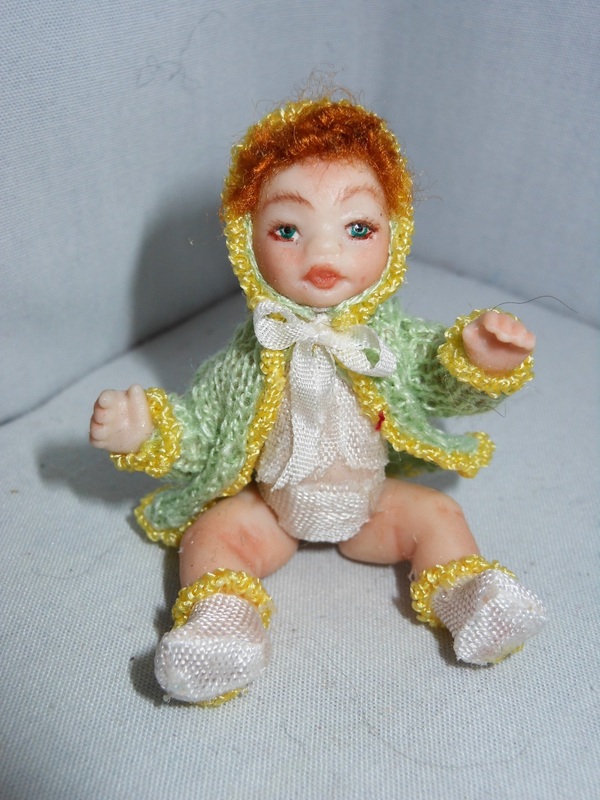 Daniel wears his white rayon diaper and hand knitted light baby blue sweater and cap set trimmed with white bunka and a white silk ribbon bow under his chin. His tiny white rayon booties are trimmed with blue bunka. Daniel has brown hair and blue eyes. He is cooing to someone as he stretches his little body waking from his nap. He is lying on his lovely light blue hand crocheted baby blanket that measures approximately 3" X 3". Bliss is a darling full porcelain dollhouse doll. She is just under 2" high and 1/12th scale. She is dressed in a diaper set ( tiny shirt and diaper) made of light purple rayon that is so soft and silky to the touch. Bliss is bald and wears a tiny white headband around her little head with a purple rose on it. She wears tiny purple booties on her little feet with matching roses on them. Bliss is holding her white cotton 'blankie' and has a pacifier in her sweet little mouth. She has fallen asleep on her silk purple knitted blanket and pillow decorated with lush light purple ruffles and more roses on the corners.